As two spaces close, what is the future of coworking in Fort Collins? In an article posted on November 8th, 2016, Erin Udall of the Coloradoan interviewed DWC owner and training manager, Stu Crair, about the current climate of coworking in Fort Collins. With recent closures of Galvanize and InkPad coworking spaces, there is a shift of the coworking community in Northern Colorado. The future of coworking in this region may seem a little confusing at the moment. However, as Stu points out, there is a lot to be excited about. 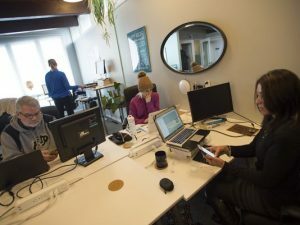 CoWorking is a growing movement and Fort Collins has such an entrepreneurial spirit behind it, that coworking spaces are a great fit for this community. Spaces like Cohere and The Articulate are helping to define a unique, innovative coworking culture. As far as Digital Workshop Center is concerned, the future of coworking is very bright. If you would like more information on CoWorking at DWC, click here or contact our offices for more information.